The fact that improperly-treated gray water pollution is still being dumped off ships in a so-called modern and highly-regulated shipping industry is hypocritical at best. Graywater – which comes from ship accommodation areas (shower/sink), laundry, galley and food pulper – can contain classical pollutants such as nonylphenols, metals, nutrients, surfactants, pathogens, oil, grease, detergent and soap residue. Graywater is sometimes mixed with sewage, depending on the ship design. Graywater can have varying levels of harmful contaminants. In fact, untreated graywater characteristics are similar to, and in some cases, have higher concentration of constituents than domestic sewage entering land-based wastewater treatment plants (EPA-800-R-11-001). 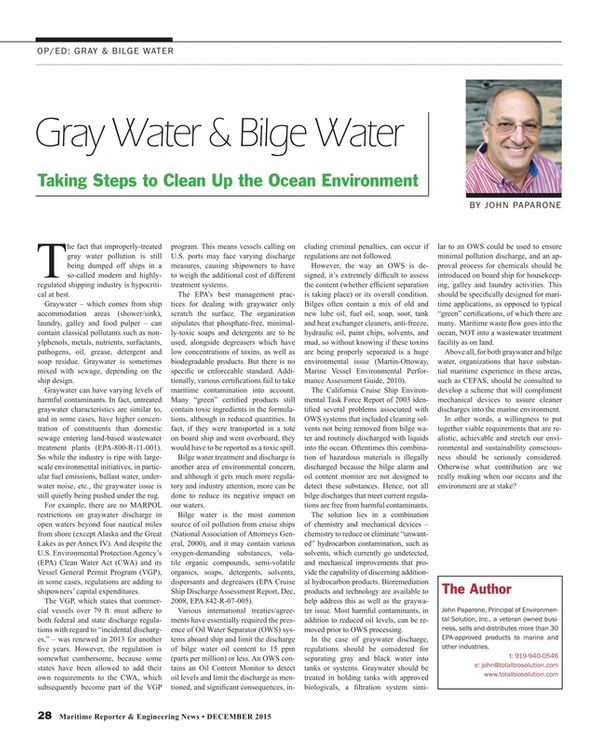 So while the industry is ripe with large-scale environmental initiatives, in particular fuel emissions, ballast water, underwater noise, etc., the graywater issue is still quietly being pushed under the rug. For example, there are no MARPOL restrictions on graywater discharge in open waters beyond four nautical miles from shore (except Alaska and the Great Lakes as per Annex IV). And despite the U.S. Environmental Protection Agency’s (EPA) Clean Water Act (CWA) and its Vessel General Permit Program (VGP), in some cases, regulations are adding to shipowners’ capital expenditures. The VGP, which states that commercial vessels over 79 ft. must adhere to both federal and state discharge regulations with regard to “incidental discharges,” – was renewed in 2013 for another five years. However, the regulation is somewhat cumbersome, because some states have been allowed to add their own requirements to the CWA, which subsequently become part of the VGP program. This means vessels calling on U.S. ports may face varying discharge measures, causing shipowners to have to weigh the additional cost of different treatment systems. The EPA’s best management practices for dealing with graywater only scratch the surface. The organization stipulates that phosphate-free, minimally-toxic soaps and detergents are to be used, alongside degreasers which have low concentrations of toxins, as well as biodegradable products. But there is no specific or enforceable standard. Additionally, various certifications fail to take maritime contamination into account. Many “green” certified products still contain toxic ingredients in the formulations, although in reduced quantities. In fact, if they were transported in a tote on board ship and went overboard, they would have to be reported as a toxic spill. Bilge water treatment and discharge is another area of environmental concern, and although it gets much more regulatory and industry attention, more can be done to reduce its negative impact on our waters. Bilge water is the most common source of oil pollution from cruise ships (National Association of Attorneys General, 2000), and it may contain various oxygen-demanding substances, volatile organic compounds, semi-volatile organics, soaps, detergents, solvents, dispersants and degreasers (EPA Cruise Ship Discharge Assessment Report, Dec, 2008, EPA 842-R-07-005). Various international treaties/agreements have essentially required the presence of Oil Water Separator (OWS) systems aboard ship and limit the discharge of bilge water oil content to 15 ppm (parts per million) or less. An OWS contains an Oil Content Monitor to detect oil levels and limit the discharge as mentioned, and significant consequences, including criminal penalties, can occur if regulations are not followed. However, the way an OWS is designed, it’s extremely difficult to assess the content (whether efficient separation is taking place) or its overall condition. Bilges often contain a mix of old and new lube oil, fuel oil, soap, soot, tank and heat exchanger cleaners, anti-freeze, hydraulic oil, paint chips, solvents, and mud, so without knowing if these toxins are being properly separated is a huge environmental issue (Martin-Ottoway, Marine Vessel Environmental Performance Assessment Guide, 2010). The California Cruise Ship Environmental Task Force Report of 2003 identified several problems associated with OWS systems that included cleaning solvents not being removed from bilge water and routinely discharged with liquids into the ocean. Oftentimes this combination of hazardous materials is illegally discharged because the bilge alarm and oil content monitor are not designed to detect these substances. Hence, not all bilge discharges that meet current regulations are free from harmful contaminants. The solution lies in a combination of chemistry and mechanical devices – chemistry to reduce or eliminate “unwanted” hydrocarbon contamination, such as solvents, which currently go undetected, and mechanical improvements that provide the capability of discerning additional hydrocarbon products. Bioremediation products and technology are available to help address this as well as the graywater issue. Most harmful contaminants, in addition to reduced oil levels, can be removed prior to OWS processing. In the case of graywater discharge, regulations should be considered for separating gray and black water into tanks or systems. Graywater should be treated in holding tanks with approved biologicals, a filtration system similar to an OWS could be used to ensure minimal pollution discharge, and an approval process for chemicals should be introduced on board ship for housekeeping, galley and laundry activities. This should be specifically designed for maritime applications, as opposed to typical “green” certifications, of which there are many. Maritime waste flow goes into the ocean, NOT into a wastewater treatment facility as on land. Above all, for both graywater and bilge water, organizations that have substantial maritime experience in these areas, such as CEFAS, should be consulted to develop a scheme that will compliment mechanical devices to assure cleaner discharges into the marine environment. In other words, a willingness to put together viable requirements that are realistic, achievable and stretch our environmental and sustainability consciousness should be seriously considered. Otherwise what contribution are we really making when our oceans and the environment are at stake? John Paparone, Principal of Environmental Solution, Inc., a veteran owned business, sells and distributes more than 30 EPA-approved products to marine and other industries.